When should you take the nestbox away from the doe and the baby rabbits’ cage? 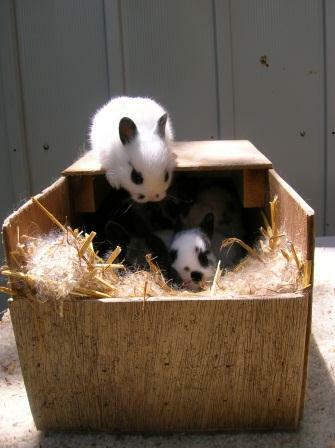 I remove the nest box at three weeks of age in cold weather and two weeks of age in hot weather. To help with the transition, I may place a large handful of hay in the cage for the bunnies to snuggle into. I’ve often given them an empty oatmeal box for a few days so that they have a warm place to cluster together. In the past, I tried placing the nest box on its side, but the dam would climb up on it and jump down on the babies. I had one injured that way, so I quit using the nest box that way. After two or three days, the babies have acclimated to being on the wire. You will notice when they first get out, they try to nurse and the mom spends her time avoiding them. Within a few minutes or hours, that subsides and they coexist on the wire peacefully together. Make sure that your cage protects these babies from being hurt by rabbits in the neighbor cages. In my first litter, a dam reached through and grabbed a baby and ripped the fur on its neck. You can use babysaver wire or line the adjoining walls with hardware cloth that the dam next door cannot reach through. You may be concerned about the kits’ feet falling through the spaces in the wire floor. It does take them a little practice to walk on the wire and little feet may poke through from time to time. Luckily, they do not weigh enough at this point to cause a lot of damage. At this point, I provide the kits with their own water dish (even though I’ve seen babies as young as three weeks using the automatic watering system) and food dish of their own. I sprinkle their pellets with a mixture of sunflower seed hearts and oats. They get the oat-seed mixture until they are five weeks old. Then I suspend it until they are between three and four months old. This practice put an end to a rash of weaning enteritis I had several months ago. Kits get a constant supply of hay as well. Once the kits are on the wire, the whole group of bunnies is on a free feed schedule until weaning. Next Article: How often should you breed your doe?